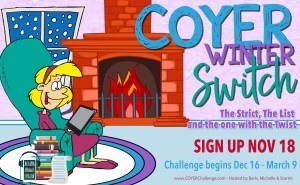 This is my Wrap-up Post for the COYER challenge being hosted by Berls @ Fantasy is More Fun, Michelle @ Because Reading & Stormi @ Books, Movies, Reviews! Oh My! I actually did have a 10th audiobook, The Night Child by Anna Quinn, that I finished on March 10th.